From lavender to royal purple, purple baby bedding sets are the foundation of baby nursery themes and color schemes that you will love! Pink and purple is a perfect combination for a girly, girl princess nursery decorated with touches of royal decor while a purple and lime green baby room has a modern look that is both trendy and charming. 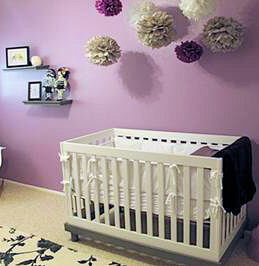 Pictures of purple crib sets that are often made and sent in by our visitors are a valuable resource filled with nursery decorating ideas that can be used as inspiration. 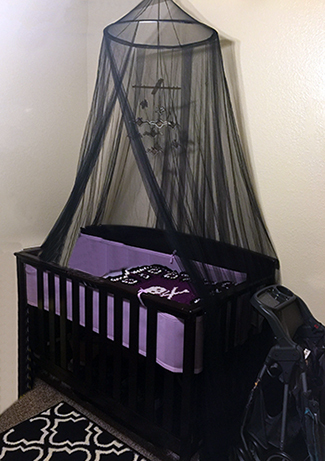 This purple and black nursery features not only a stunning homemade crib set and baby mobile but stunning reclaimed furniture painted to match the dramatic color scheme and theme. Take a look at the pictures of baby rooms decorated in shades of lavender that moms, willing to share their decorating ideas, have posted in our photo gallery. 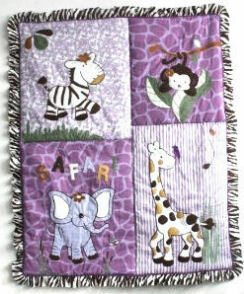 A set of baby giraffe nursery bedding set has so many possibilities. A decorator might focus on decorating the space using giraffe print or a general safari style of decor with a variety of jungle animals. And isn't it lovely that we now have bedding for feminine jungle nurseries? I can remember a time when a jungle theme was by necessity, gender neutral. 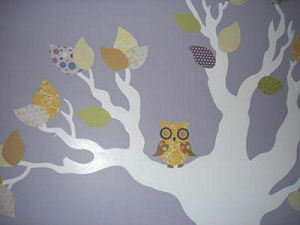 See more pics of this purple and green baby owl nursery with lavender wall paint decorated with homemade, fabric baby owl tree mural decals. Does this mean that you should bounce out and fill up your shopping cart with piles of decorations covered in purple butterflies, dragonflies or baby stuff covered in dots to match your baby girl's bedding set? Probably not, because not only does a little go a long way but chances are that the fabric in your crib quilt probably has some tips on decorations that will stay in keeping with your baby girl’s nursery bedding theme and give the room a balanced style of decor that will look like the work of a professional decorator. And as most decorating professionals know; the best ideas are based on the personality of the room's occupant. For instance, most dragonfly collections throw in a few butterflies, ladybugs and flowers for good measure and butterfly baby bedding sets might return the favor by featuring a few dragonflies on the coordinating nursery decorations as well as the fabric that was used to sew the purple baby bedding set. The color combination of pink and purple might be overwhelming in a small space where a combination of purple and yellow is sunny and bright. Share pictures of your cute, purple nursery! 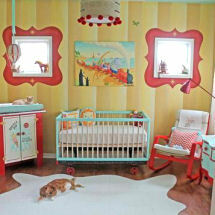 CHECK OUT THE CUTE NURSERIES DECORATED BY MOMS JUST LIKE YOURSELF! There are any number of themes that would be pretty in this color scheme including a cute cupcake nursery or perhaps rather than a theme a print like polka dots would be nice. I usually suggest decorating a nursery in polka dots to a customer and include some examples with stripes, squares or other designs on the inspiration board. Purple and White – As unusual as this may sound this combination might work if you balance it with basic black. This color scheme is in my purple nursery ideas file to suggest to a client that requests a zebra nursery theme as a choice to consider over hot pink but I have not used it yet. 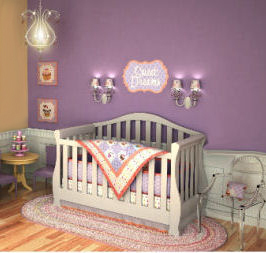 There you have the basics of designing a purple nursery using readily available purple baby bedding sets that are very popular and if you play your cards right, downright cheap! The best tip that I can share is to save yourself a lot of effort by choosing your favorite purple baby bedding set and take it from there. When you are finished decorating, please return to Unique Baby Gear Ideas to see more lavender and purple nursery ideas and you are also invited to use the form below to upload pictures of your project.